For the last several days, the weather in the Piedmont of North Carolina has been unseasonably warm — lows in the 40-50-degree Fahrenheit range, highs in the 70s. A cold front will be blasting through overnight, and the animals in my yard seem to know this. They have been very active, almost frantically feeding. The birds have been loitering on the feeders, and today around noon, I spotted a chubby White-Footed Mouse scrounging for tidbits in my front flowerbed, where I had cleaned up frost-killed perennials the day before. The mouse ignored me entirely, even when I charged it, yelling unladylike language. I thought it must be very hungry to be so bold. But two hours later, when I found the scene above, I wondered if perhaps something hadn’t been quite right about that well-fed-looking rodent. I am always astonished at how snakes can dislocate their jaws to swallow prey. 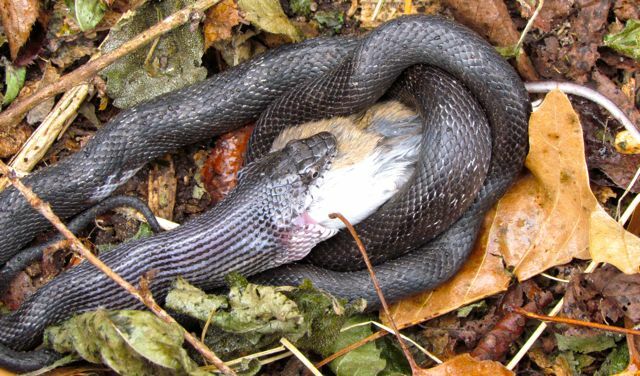 See how the snake has wrapped its body around the mouse? Black Rat Snakes are constrictors; they squeeze the life out of their prey. For any wondering why I didn’t intervene, the mouse didn’t move during all the time I was shooting photos; neither did the snake, for that matter. And besides, I have a rule on my five acres: no interference between native predator and prey animals. Everybody’s gotta eat, right? If you click on these photos to enlarge them, you’ll see rain droplets on the body of the snake. It was just beginning to mist heavily when I spotted this slow-motion death scene. I was going to go back out and take more photos, but the rain grew heavy and steady. It won’t stop now until after the front passes tomorrow morning. 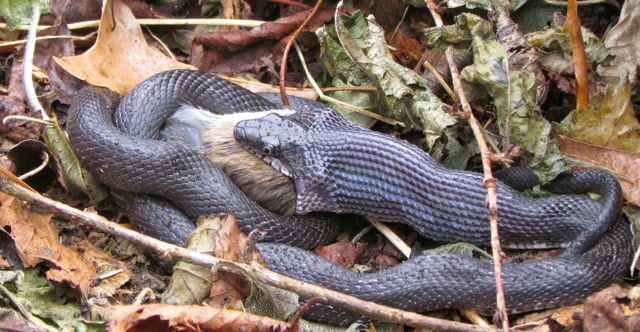 I was worried that the snake might get too cold before it could swallow its prey and move to a sheltered spot, so I donned my raincoat and went looking for it. It was no longer coiled where I had left it, but it hadn’t gone far. Fully stretched out beneath the weeping cherry beside my walk, it sported a large bulge a few inches from its head — the current location of the careless rodent. 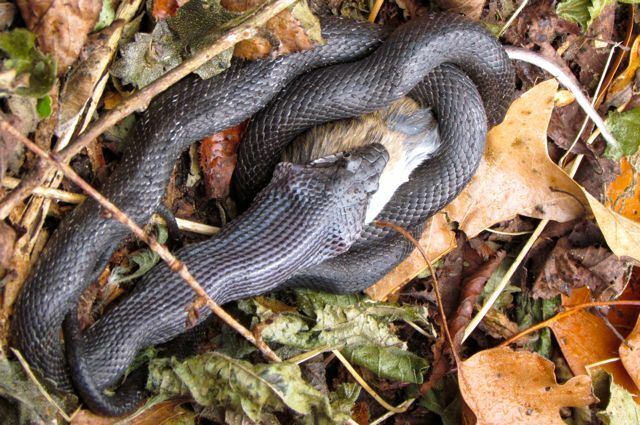 I congratulated the snake on its clever feasting just before the cold spell; it should fare well as lower temperatures slow its metabolism. And I thanked it for helping to control the local rodent population. This entry was posted on November 28, 2011, 6:02 pm and is filed under Native Wildlife, piedmont gardening. You can follow any responses to this entry through RSS 2.0. You can leave a response, or trackback from your own site.